Engineers at NASA’s Plum Brook Station in Sandusky, Ohio, began the first of a series of modal tests on a structural representation of the crew module adapter (CMA) for Orion. The CMA will connect the capsule to the ESA (European Space Agency)-provided service module for the spacecraft’s next mission, Exploration Mission-1. The service module is designed to be the powerhouse that fuels and propels Orion in space. The tests at Plum Brook Station shake structural elements at various frequencies to simulate how launch vibrations and acoustics will affect the spacecraft during its trip to space atop NASA’s Space Launch System rocket. 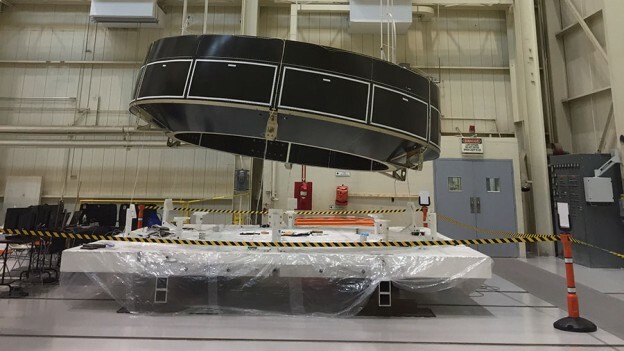 They are being conducted ahead of the arrival of a structural representation of the ESA service module to the facility this fall for additional testing. Engineers are using a “building block” approach to testing in which they evaluate each piece as the elements composing the service module are stacked atop each other to validate it before flight hardware begins arriving in 2017. Great news about ESA service module integration with Orion. This is proof that working together is fantastic. Look forward to seeing EM-1 in 2017.